Home religion “This is F**kery of the highest order” — Daddy Freeze reacts to viral video which shows RCCG members worshiping the chair of their General Overseer. 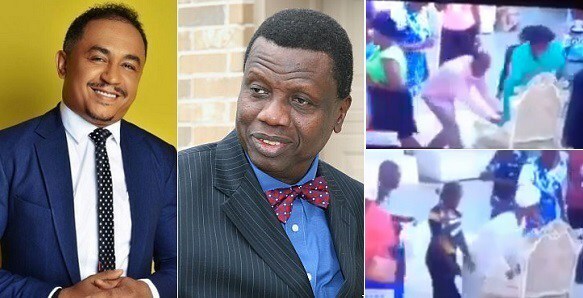 “This is F**kery of the highest order” — Daddy Freeze reacts to viral video which shows RCCG members worshiping the chair of their General Overseer. Controversial OAP, Daddy Freeze has reacted to viral video which shows some alleged RCCG members worshiping the chair of their General Overseer. According to the user who shared the video, the members worshiped the chair which the general overseer sat on – Freeze then reacted to the video, which he calls “fuckery of the highest prder“. WATCH THE VIDEO HERE, ALSO COMMENT ON THIS!! 1) John 5:39,40 " Search the scriptures, for in them you think you have eternal life, but these are they that testify of me and never come to me that you may have life. 2)2 Tim 2:15 " study to show yourself approved unto God a workman that needed not to be ashamed, rightly dividing the word of truth"
I can go on and on but let me pause here to paunder a while and hope to change the discuss and focus now.